With the shock result of the earlier match in Group B still ringing in the ears, heads turned with keener eyes towards the highly-rated Chile team expected to challenge South Africa’s finalists. Jorge Sampaoli continued where Marcelo Bielsa left off as Chile coach, playing a high octane ultra-attacking style, while Alexis Sanchez and Arturo Vidal have moved on to some of the biggest clubs in the world since their exit at the hands of Brazil in the last tournament – the latter making a legitimate claim to being the most complete player on the planet. They lined up in what could roughly be described as a 4-3-3 or 4-4-2 diamond formation. With Jorge Valdivia playing as a false nine, the direct threat to goal was to come from Eduardo Vargas and Sanchez moving diagonally from the wings, while Eugenio Mena and Mauricio Isla raced forward from full-back to provide width and the midfield also joined the attack with quick one-twos. Dropped in a group with two great footballing nations and the dark horses, Australia could be forgiven for feeling the need to be a bit defensive. They weren’t however. Ange Postecoglou sent out his team in a 4-2-3-1 with attacking midfielder-poacher hybrid Tim Cahill leading the line for a side otherwise lacking in talent, and they looked to press and harass the Chileans. While the positive approach should be credited, Chile’s movement meant this wasn’t a very effective way of keeping hold of them. Their midfield was drawn forward and their wingers pushed back, while Valdivia’s deeper role lured the Australian centre-backs out of the defensive line. Their opener was a bit scrappy but the second highlighted Australia’s problems in tracking the Chileans – Vargas’ decoy run across goal giving Valdivia the space to smack it into the top corner. With a strong lead, Chile eased off. Their style of play must be exhausting, particularly in the Brazilian heat, but there is a huge difference between Chile at full pelt and Chile at a jog. Tommy Oar and Mathew Leckie looked as if they should be playing rugby rather than football (and their names sound better suited to being an eighties TV cop duo). Strong athletes severely lacking in technical ability, but no longer pinned back, they were able to race forward and hit crosses in for Cahill, while the full-backs behind them could also venture forward to whip in balls for Cahill and Mark Bresciano settled into his supporting position. Their supply was inconsistent but did exploit one of Chile’s weaknesses: centre back pairing Gonzalo Jara and Gary Medel are just 5ft 10 and 5ft 7 respectively, and, while Cahill isn’t much taller, he is excellent in the air, so it wasn’t a great shock when Australia grabbed a goal back. 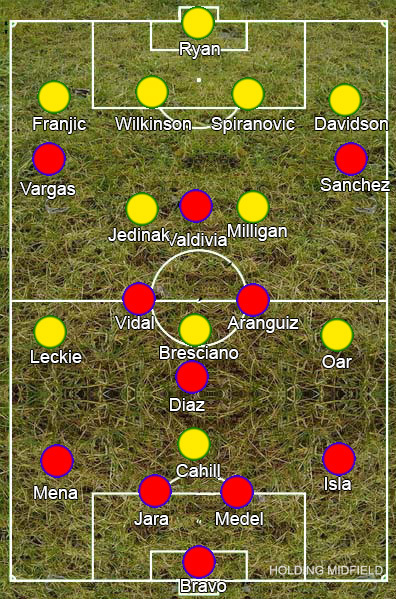 The introduction of Jean Beausejour for Valdivia changed Chile to a 4-3-3 formation that allowed them to pin back Australia’s wide players once again, stemming the flow of balls into the box. Beausejour underlined his importance in re-establishing Chile’s dominance with the goal that sealed the win. Chile thrilled and showed their weaknesses to the world as they have at each tournament, while Australia could come away with their pride still intact but not with what would really be undeserved points.